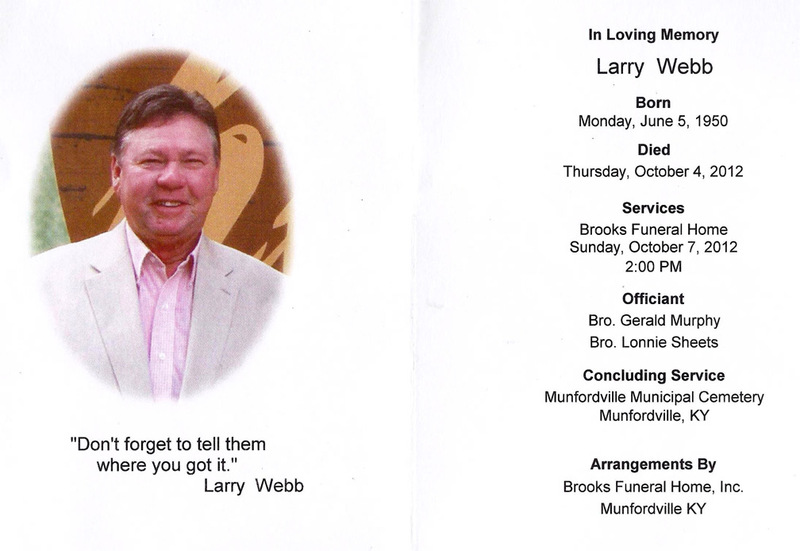 Larry Webb, age 62, of Munfordville, KY, passed away Thursday, October 4, 2012, at T. J. Samson Community Hospital in Glasgow, KY. He was employed by Woodmen of the World, a member of the Caveland Country Club and Woodman Lodge 939. He was a US Navy veteran and a Baptist. He was the son of the late Rev. J. W. Webb and the late Ella Webb. He is survived by his wife: Marsha Stinson Webb; three daughters: Natalie N. Webb (Bradley P. Williams), Glasgow, KY, Abby L. Cook (Brandon C.), Munfordville, KY, Ashley L. Lowe (Andrew W.), Clarksville, TN; two brothers: Danny W. Webb, Glasgow, KY, James M. Webb, Junction City, KS; two grandchildren: Annika L. Lowe, Anderson W. Lowe. Besides his parents, he was preceded in death by two grandsons: Zachariah Cook and Christian Cook as well as two sisters: Patsy Caroline Webb and Diana Webb. The family will receive friends from 10:00 AM to 9:00 PM, Saturday, October 6, 2012 and from 10:00 AM to 2:00 PM, Sunday, October 7, 2012 at Brooks Funeral Home. Funeral service will be 2:00 PM, Sunday, October 7, 2012 at Brooks Funeral Home with Bro. Gerald Murphy and Bro. Lonnie Sheets officiating. Interment will be at Munfordville Municipal Cemetery, Munfordville, KY. Memorial donations can be made to the March of Dimes.